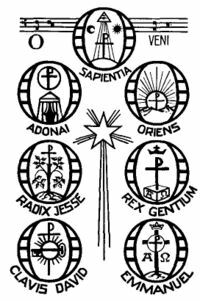 Tomorrow, December 17, the Church begins the seven Great "O" Antiphons of the liturgy, that date back to the seventh or eighth century. These antiphons are chanted or recited at Vespers, or Evening Prayer, the Antiphon before the Magnificat. They are also the Alleluia verse at the Mass. Each antiphon begins with "O" and include a different Scriptural image through the Old Testament, all imploring the Messiah to come. As Elsa Chaney in Twelve Days of Christmas states, "They seem to sum up all our Advent longing as they paint in vivid terms the wretched condition of mankind and his need of a Savior." The Church enters to-day on the seven days which precede the Vigil of Christmas, and which are known in the liturgy under the name of the Greater Ferias. The ordinary of the Advent Office becomes more solemn; the antiphons of the psalms, both for Lauds and the Hours of the day, are proper, and allude expressly to the great coming. Every day, at Vespers, is sung a solemn antiphon, consisting of fervent prayer to the Messias, whom it addresses by one of the titles given Him in the sacred Scriptures. In the Roman Church, there are seven of these antiphons, one for each of the greater ferias. They are commonly called the O's of Advent, because they all begin with that interjection. In other Churches, during the middle ages, two more were added to the these seven; one to our blessed Lady, O Virgo virginum; and the other to the angel Gabriel, O Gabriel; or to St. Thomas the apostle, whose feast comes during the greater ferias; it began O Thoma Didyme. There were even Churches where twelve great antiphons were sung; that is, besides the nine we have just mentioned, O Rex Pacifice to our Lord, O mundi Domina to our Lady, and O Hierusalem to the city of the people of God. The canonical Hour of Vespers has been selected as the most appropriate time for this solemn supplication to our Saviour, because, as the Church sings in one of her hymns, it was in the evening of the world (vergente mundi vespere) that the Messias came amongst us. These antiphons are sung at the Magnificat, to show us that the Saviour whom we expect is to come to us by Mary. They are sung twice, once before and once after the canticle, as on double feasts, and this to show their great solemnity. In some Churches it was formerly the practice to sing them thrice; that is, before the canticle, before the Gloria Patri, and after the Sicut erat. Lastly, these admirable antiphons, which contain the whole pith of the Advent liturgy, are accompanied by a chant replete with melodious gravity, and by ceremonies of great expressiveness, though, in these latter, there is no uniform practice followed. Let us enter into the spirit of the Church; let us reflect on the great day which is coming; that thus we may take our share in these the last and most earnest solicitations of the Church imploring her Spouse to come, to which He at length yields. As mentioned by Gueranger, there have been more than seven antiphons over the years until the number seven was established in the Roman rite. There are still some orders or rites that have an extra Marian antiphon, the antiphon O Virgin of Virgins. Father Saunders: What are the O Antiphons? Father Z: What Does The Prayer Really Say? which includes mp3 recordings of the latin chant. This is my favorite part of Advent. It all started when we read the section in Cooking for Christ by Florence Berger called O Antiphon Days and implemented the practice in our family. My mother helped the little ones, but even my dad got involved, and each person supplied a special treat after dinner for celebration of the Great Os. Then at prayer time we opened up the new window of our Advent Tower and sang the corresponding verse to O Come O Come Emmanuel. It was very simple, but it made a lasting impression. I never tire hearing or singing this Advent hymn, as it just conjures all the Old Testament longing with a haunting melody. Somewhere in every obedientary account is the entry: 'To the gardener, for his O -- 26s.8d', or whatever the standard contribution was in that house. Sometimes the entry refers to the gardener's 'O et Olla', sometimes just his 'Olla'. Whatever the form of the 'O' it signified the gardener's special day, and there were six other obedientiaries who also had 'O' days. The origin of the 'O's is a mosaic of excerpts from the Prophetic and Sapential books of the Old Testament, all beginning with the invocation 'O'. Each of the seven 'O' antiphons was awarded to the obedientary whose job mostly closely corresponded to its opening words. For instance, the one beginning 'O Clavis David' (O Key of David) belonged to the cellarer because he had charge of all the keys in the house. The 'O's were sung at Vespers on successive nights from December 16-23, making a festive preparation for Christmas, and on the day of his 'O' the obedientary led the singing of it in the choir, had a day off work and had a feast laid on him by the other obedientiaries. The 'O's were big occasions, and the third of them 'O Radix Jesse' (O Tree of Jesse), belonged to the gardener, which made him a more important obedientary than his small budget, indeed his nonexistence in some houses, would imply. In continental monasteries other 'O' antiphons were added to the Advent seven, until as many as eighteen were sung in some houses. But English monasteries kept to seven 'O's and kept their celebratory pittances comparatively restrained, if only so that digressions lasted through the week. At Durham on the day of the prior's 'O', 'O Sapienta', the Master of the Common House provided 'a solemn banquet of figs and raisins, ale and cakes, and thereof no superfluity or excess, but a scholastical and moderate congratulations amongst themselves'. Obedientary status entailed more than enough work and responsibility to merit some ale and cakes and moderate congratulation once a year. These antiphons are also put to a beautiful chant. Musica Sacra has a recording of the Gregorian Chant of the , O Antiphons by Scott Turkington, including the Magnificat. It's just breathtakingly gorgeous. It is interesting to note that when one puts first letters of each Latin antiphon, starting from the last to the first, it spells ERO CRAS, which in Latin means "Tomorrow I will come." Dominican House of Studies has the Dominican version of the chants online. An Advent Processions Based on the Great "O" Antiphons by the Choirs of St. Mark's Cathedral in Seattle, Washington. Because these are ancient chants, there is so much available to meditate on these jewels of our liturgy. I have a few books that are out-of-print, but you might already have them on your bookshelf, or find a used copy to buy or borrow. These are spiritual classics, with meditations on the Liturgical Year. Only McGarry's volume is specific to Advent. The Liturgical Year, Advent, by Dom Gueranger, O.S.B. It's so good to have tangible objects for our Domestic Church. I mentioned my family used a cardboard Advent Tower that came in a kit, but sadly it's not in print. There is an O Antiphon House which is a flat cardboard suggestion. Another mom said she took small cardboard circles used for cakes (with gold on one side), decorated an antiphon on each, and attached to a long ribbon, turning the circle around for the current day. She's also done embroidered antiphons. Alice had this wonderful idea for Advent Cubes, including O Antiphons. May your family enjoy these final days to Christmas. May you unite your longings for the Saviour with all the pleading of the Antiphons, and pray together with the Church "O Come, Emmanuel." A great compilation, Jenn. Thank you. Thanks to all of you, Jen, Alice, and Katherine, I am enriched by really using this craft, my O Antiphon House, to pray (and sing)the Antiphons with my children this Advent.